The Midlands Entrepreneurial Desk with support from the Office of the Deputy Vice-Chancellor: Research, Innovation and Engagement and Centre for Social Entrepreneurship held a stakeholder engagement session titled: Creating Local and Regional Innovation & Entrepreneurial Ecosystems: Stakeholder Engagement Workshop on 13 March 2018 at Golden Horse Casino, Pietermaritzburg. The purpose of this workshop was to bring together representatives and partners from key departments involved in research, innovation, entrepreneurial training, universities, service delivery departments, industry and provincial governments’ representatives and practitioners. The workshop also shared a focus on business models and learning experiences as part of the broader discussion on strengthening innovation, entrepreneurship and interfaces amongst all stakeholders. It also helped to create a knowledge and information sharing platform on innovation and entrepreneurship, DUT’s current state as part of the KwaZulu-Natal Province and how DUT interfaces with its local and regional ecosystem and how it can contribute to the broader regional and KZN economic growth. 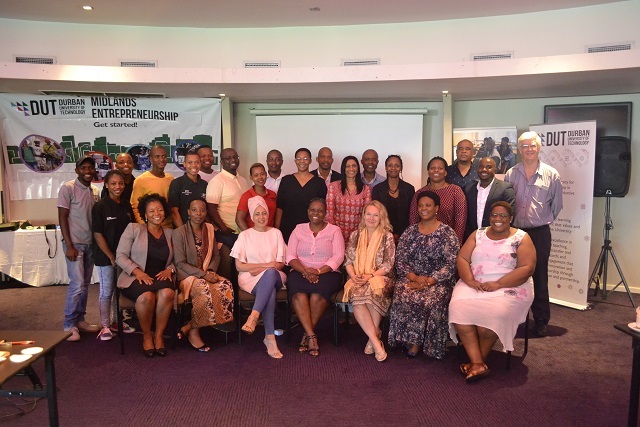 The workshop also served as an excellent platform to establish and gain insight into how academic and support departments are involved in entrepreneurship as well as current entrepreneurial activities taking place in the Midlands Campuses. The workshop attracted attendees from various institutional departments (academic and support) and organisations (from the business, government and non-governmental sectors) for robust engagement on entrepreneurship involvement and creation of local and regional entrepreneurial ecosystems for the Midlands Campuses. In attendance was Prof Sibusiso Moyo, Deputy Vice-Chancellor: Research, Innovation and Engagement; Dr Poppet Pillay, Director: Centre for Social Entrepreneurship and Ms Jaana Puukka from Innovation Engage in France. She was in South Africa at the invitation of DUT to review the University’s capacity of innovation and entrepreneurship as part of the local and regional ecosystem. Also in attendance were Ms Ntokozo Ngcobo from the Midlands Entrepreneurial Desk and Mr Romeo Matumba, who had facilitated the workshop as Programme Directors. The recommendations received from the meeting will inform the DUT Entrepreneurial and Innovation strategy that puts students at the centre and intentionally embeds entrepreneurship in student curricula as part of ensuring DUT students become active and productive citizens. Story and Picture Supplied By Ms Nontokozo Grace Ngcobo: Coordinator of the Midlands Entrepreneurial Desk.